We R Memory Keepers Ultimate Cutting Tool Kit + a Giveaway! If you are like many scrappers I know, myself included, you are always on the lookout for just the right cutting tool. We R Memory Keepers has come up with what they call The Crafter’s Ultimate Cutting Tool Kit. This kit includes a 17x14” magnetic cutting mat, eight magnetic posts, an 18” magnetic ruler, an art knife with five replacement blades, a hand held rotary cutter with two replacement blades and a scoring blade, and a circle cutter with magnetic base and five replacement blades. I know what you are thinking…”wow! That’s a big tool kit!” You’re right, it is a big kit, it has every kind of blade you would ever need. After having this kit on my desk for a couple months now, I have to say, I didn’t reach for its components as much as I thought I’d might. It takes a bit of time to set up your cuts. You first, have to line up your paper on the grid, then secure the paper with the magnets, all before making your cut. Sometimes, I would just grab my “ole trusty” trimmer instead of fooling with all those steps. Although, the more I use it, the quicker I get. I think this is pretty true with any new tool, it just takes some time to become efficient with it. The mat and the ruler were used pretty often (even for cutting fabric). The rotary blade and scoring blade are quite handy (especially for card making). The circle cutter… well, it seems to have a bit of a learning curve with it. I was having some serious issues trying to get it to cut a good circle. As I was turning the cutter, the magnetic base was sliding, giving me more of an egg shape than a circle. The good people at We R Memory Keepers has provided a very handy .pdf file just for people like me, having trouble using it properly. Now, after reading the tips and tricks, and playing with the circle cutter a bit more, I am finally able to cut a proper circle! The magnetic ruler and mat has a nice strong hold, even strong enough to use for cutting fabric. The mat is bigger than your standard 12x12” layout, giving you a nice surface to work on. The magnetic posts are great for keeping your paper secure for cutting, as well as keeping it from sliding while stamping, or even for holding down loose elements on your layouts and cards. You get a TON of extra blades for all the tools! So, you won’t be running out anytime soon. It’s super portable. The mat is light and thin, and you only need to take the tools you will use. I like having the angles marked out on the mat, that can come in very handy! No more protractors. The circle cutter has a learning curve to it. It really takes some practice to get it right. You have to keep track of all the little parts. There are quite a few smallish items in the kit. For me, that is sometimes an issue when my desk is a wreck. For my projects, I decided to show off what I could do using the circle cutter tool in the kit. 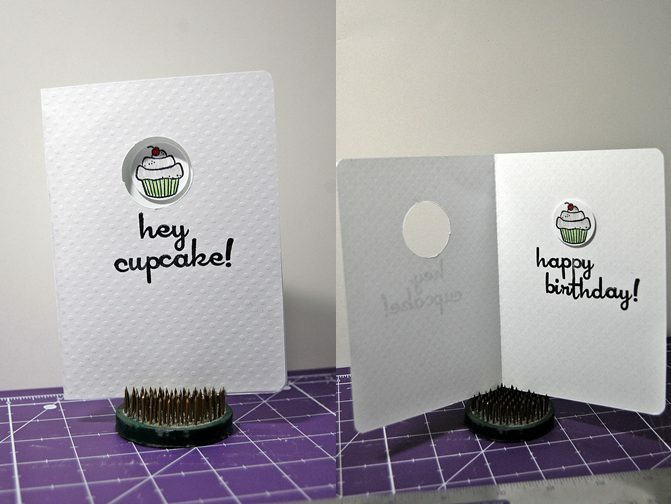 For this card, I used the circle cutter to make the ring as well as the multi-sized circles(even the tiny ones). Overall, I think this is a great kit to have. Even though, I had some issues with the circle cutter, I liked it enough to purchase an accessory or two to go with the magnetic mat. What do you think? Tell us what you think about this cutting kit? Does the magnetic circle cutter work for you? Would you just rather just stick with your “ole trusty” trimmer? Or does this one look like the one for you? Leave your comment by noon EST on Tuesday to be entered to win your very own Ulimate Cutting Tool Kit! If I were a newish scrapper, I would probably purchase this kit and get everything I need in one whack. However, I have all of these same type of items that I have gagthered over the years and am comfortable using the ones I have, so I most likely will not spring for this. However, I enjoyed reading the review and looking at the tips for the circle cutter - I have one that I don't use because I find it too cumbersome, but maybe I can apply these tips and get good results. Thanks! Yes, I would purchase the kit! I've have been shopping for a large magnetic cutting mat for a couple of weeks. Would you believe I have been using a 10x12 cutting mat for 5 years? It's so small! LOL Thank you for your review. If I win it will be great if not I will go out and purchase the cutting kit. Thanks again. Interesting. I am on the hunt for a good circle cutter. I'm guessing this isn't one to start with, though. Don't include me because I have a newer version of this. I love it. I don't do too many straight cuts with it-give me my Fiskar's trimmer everytime-but I love the circle cutter. But the biggest reason I bought it was for the mat.It's huge and the angled lines are fantastic. I use the craft knife when I cut something on an angle and it works like a charm. This is definitely something I will have to look into some more! Thanks for the review! Great review! I've been eyeing this! I have most of these tools, but from different manufacturers. I use them quite a lot. I like the magnet idea; I'm sure it would be easier with that. I'd definitely be interested in a kit like this, especially if I won it! I love the ideas of the magnetic mat. And I would love to try the circle cutter. Thanks for a great review! This looks like a great kit. I do like that it is so multi-functional. I have a great circle cutter, but I am sometimes limited by sizes and this would help that out a lot. That's a kit that I would really put to use. I've thought for a long time about getting a magnetic cutting mat, especially when my work slides around as I cut it. I'm all about accuracy, at least with the cutting. Knowing there's a tips page for the circle cutter makes it much less intimidating. Thanks! I also like the idea of the magnetic cutting board. I have been frustrated lately with my regular cutter and this looks like something I would be happier with. Thanks for the review and heads-up on the learning curve. I would love the magnetic mat to help me keep things where I put them. Kids and fans tend to scatter my things sometimes. And I would love to try a new circle cutter; I sometimes avoid using circles when I want to because I'm afraid my circles wouldn't be perfect. What a neat tool! I have yet to find a trimmer that cuts straight so my tools of choice is always a knife and mat. This one has been on my wishlist for a bit now, just for the size alone. There is nothing more frustrating than trying to trim down paper with a ruler that is barely 12 inches, LOL! I would love to win this beauty!!! Love the size of the mat, and that it's magnetic too! I'd happily store all the little 'whatsits' in a small tin or box so they'd be handy. Would love to win one of these! I love love love my circle cutter and could always use another one .. but really love what you guys did with these .. I would love to have a tool like this, Having problems with arthritis, I think it would make it easier for me to cut shapes and angles for my layouts. Great review, again! I love knowing the pros and cons! Looks like a great kit....especially the mats and the magnets. Looks like a great kit to have, all the cutting tools in one kit! I love all the projects you made with it, and looks like you mastered the circle cutting quite well!! I would love something like this, I love having lines and angles to guide me, I am not a very good straight line cutter! Thanks for a great review!! I would like to give this a try!! I've been thinking about getting a bigger mat. I have the BG mat but I would love to have extra space. I'll have to keep this one in mind. Thanks! I love the magnetic mats which do seem to give better control of a project. This larger size might be worth looking into. Very cool! I have the BG magnetic mat, but don't want to mess up the surface by cutting on it. And I have the CM circle cutter, but it has size limitations. This looks like a best of both situation! I've heard that these are a bit tricky to start with but great once you get the hand of it. I would love to try one. I have been looking for a new cutter, one that actually cuts straight would be great! I have looked at these before, but not knowing how will they worked or didn't work, is why I haven't bought one! Thanks for another great review! This ones going on my list! I must be in the dark ages of scrapping (or maybe having a 3 year old and an almost 1 year old is keeping me from finding new products). I've never heard of a magnetic cutting mat! The set looks like it would be a great addition to any scrapper's collection of tools. I would LOVE to try this! I have always wanted one but with a budget I always go for the paper and glue first. The size is awesome. My cutting mat is only 8x8 so I'm constantly moving my paper while trying to cut it. That looks like a pretty cool system. Would you believe I still don't have a circle cutter-still doing it the old school scissor way. I would love to win this!!! This seems like a great cutting system. I've seen this one and wondered if it was any good--thanks for the review! I am VERY intrigued! You say there is a learning curve with the circle cutter, but you made some GREAT circles!!! I would love to give this a shot! Sounds like a little clear bag would help for all the parts?? Thanks for the review! I may not have noticed this product otherwise! What a great idea this is. I'd take learning how to cut a circle just to have it all in one spot. A little box would take cae of all the parts. Now to find one if I'm unlucky. The magnetic board sounds cool and I am always looking for a better cutting tool. This would be fun to try out! I love the mat. I haven't heard alot about this set. Thanks for a chance to win. I love how much bigger it is than your standard mat!!! Would love to see how the circle cutter works! What a great looking tool. I'd love to give it a try! Oooo . . . this looks fab! I've always wanted to try one of these magnetic cutting systems out. Right now I'm using Making Memories magnetic blade cutter, which I really like, but I'd really like to have a flat work area for cutting. I love idea of a larger mat and a circle cutter! It would save from hauling out my bulky circle cutter, glass cutting mat and all its part that I have now. I would certainly give it a try! i have a paper trimmer that I am not too crazy about, this looking interesting! I've seen all sorts of magnetic cutting tools, but the circle cutter in this one makes it a whole lot more interesting to me. Hmmm...I'm currently in love with my trimmer, but...I do like the fact that you can score with this one...and it's light!! I also like the circle cutter option. I'm forever tracing plates, bowls, cups, etc to cut out circles! I have resorted to embroidery hoops for my larger circles! But this sounds interesting! Might have to check this out! Plus the price is reasonable too. Not $40 for just one part of it and then you have to buy lots more... Thanks for taking the time to REALLY review this product!!! I think I'll be needing that .pdf file myself... Hehe! Excellent review..chock full of good info!! I'm concerned about all those small pieces too..but I love the versatility for it and I'm always on the lookout for a good cutting system. I'm adding it to my wishlist! I'm intrigued. I don't know that I would spring for it, but I love cutting tools. I think a good circle cutter would be great. I do like the idea of magnetic board too, to keep everything still. Interesting review. I find cutting systems a very personal choice. What I love, my best friend hates.... what my sister loves, I cannot stand! This has some distinct possibilities! I like the 18 inch mat to start with. Great review! I have an ancient cutting mat from Fiskars that could totally use replacing. I like the magnetic aspect of this one--and the angles! 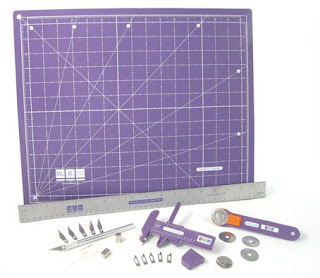 I love the whole idea of this cutting system... the magnetic mat, the precision cuts... LOVE IT! well, one day we will all find a super fab circle cutter! lol Great review chick! I always like reading the pros and cons of products. I like the size of the mat and would probably give it a try. Oh wow! This tool looks like a must have for me. Having the ruler marks on the outer edge of the cutting mat, without being covered up by the paper would be a lifesaver for me. The circle cutter would be great as I'm limited on the couple of circle punches I have. Perfect placement (in larger sizes) would rock my world. Thanks for the review. I would love to use the magnetic cutting mat. It certainly would be fun exploring the tools included in the collection. Thanks for the chance to win. I am Always up for a new tool. Thanks for the chance to win!! I would *LOVE* to win this! Cutting tools are my favorites. I'm needing something that will cut a decent circle too. Thanks for the chance to win. Mandy Thank You for the review I have thought about buying one of these and you helped me make up my mind :) You always put so much detail in your reviews! This sounds fantastic. I am not sure I would want to go about replacing all of my existing tools that I am comfortable using at this point in my life. I already own several of the options. If I wer just starting out, I would definatley take a serious look! There are several options that sound interesting, like the magnetic feature to hold down the paper. I will have to check it out at my local craft store. I would love to find a great circle cutter because what I have doesn't do the job all the time. Thanks for the review. It looks like a really handy tool to have! Thanks for the chance to win! I definitely think the large mat and magnets would be very useful! Not sure about the circle cutter. I seem to have better luck tracing something and cutting it with a scissors. But, I would be willing to give it a go. Always on the lookout for a good cutting system. I think any good tool has a bit of a learning curve to it! I have the Basic Grey cutting mat and like it quite a bit, but the We R Memory Keepers system intrigues me intrigued because of its larger size. I'm considering trying it once my Basic Grey mat wears out. Currently I am very happy with my paper trimmer but it would be a great option to have something that also cuts circles. The size of the mat looks very nice. Thanks for the chance to win! I am always looking for the perfect trimmer/cutter that does not cost a fortune in replacement blades - the circle cutting system seems neat - would have to try it out for myself to determine if it would work for me. the circle cutter interests me. How large of a circle can you cut? the mat looks great too! i love the idea of the larger magnetic mat! I tend to buy a new cutter a couple of times a year because I'm never fully satisfied. I may have to give this one a try .. sounds like it takes care of lots of issues I have with some of the others. I think the circle cutter looks pretty awesome here. i love my regular paper trimmer and can't see myself switching to the magnetic ruler and craft knife. Finding the right cutting tool is such a challenge. I loved this review, found it very informative. Great review. I have a love/hate relationship with my paper trimmer. It would be nice to have something to cut circles with tho. I'd certainly love to try it! Keeping up with the parts might be an issue, but I'd find a way! I've seen this used before and I have been very impressed with it. Have never had a chance to use one myself. I have the Basic Gray Magnetic Mat and was not impressed with it at all. I did not know that I could not use it to set eyelets and put a nice hole right through it. This looks like a much better choice. I'd be really interested to try out the magneticness of it all. I know I get frustrated cutting small pieces and trying to hold them still. And I think it would be good for angled cuts. I'm not sure there isn't anything better than CM's circle cutters though! Very interesting may have to add this to my Christmas wish list! I'd certainly like to give it a try. Looks interesting! i don't have a cutting mat like that... although i have been eyeing them up! thanks for your review! wOW THIS IS AWESOME....PUTTING IT ON MY XMAS LIST!! !